موضوع خشکسالی در مطالعات منابع آب اهمیت زیادی دارد. شاخص‌هایخشکسالیهواشناسیمستقیماًازرویداده‌هایهواشناسینظیربارندگیمحاسبهمی‌‌شوند درصورتفقدانداده‌هایمذکور،درپایشخشکسالیمفیدواقع نخواهندشد.لذاتکنیکسنجشازدورمی‌تواندابزاریمفیددرپایشخشکسالیبهشماررود. دراینتحقیقبااستفادهازتصاویرماهواره‌ایسنجنده MODIS روندتغییراتشاخصنرمالشدهپوششگیاهی استان اصفهان برای سال‌های 2000 تا 2008 بررسی شد. شاخص NDVIعلاوه بر پوشش گیاهی طبیعی برای پایش خشکسالی به ویژه خشکسالی زراعی نوع دیم هم می‌تواند مؤثر باشد. بادرنظرگرفتناینشاخص،پوششگیاهیمنطقه به4گروهطبقه‌بندی شد ومساحتهرکدامازطبقاتنیزمحاسبهشد.درنهایتدوشاخص SPI و NDVI موردمقایسهقرارگرفت. نتایجحاصل ازمحاسبه شاخص SPI حاکی از وقوع خشکسالیشدید در سال 2008 و خشکسالیمتوسطبه ترتیب در سال‌های2000 و 2001 دراستاناصفهان است. محاسبهشاخص NDVI دراینسهسالنیزنشاندادکهمیزانپوشش گیاهیضعیفبهطورقابلمحسوسیافزایشیافته است. با این حال نتایج حاصل از اثر تغییرات بارندگی بر روی شاخص NDVI نشان داد که همزمانی وقوع خشکسالی هواشناسی و خشکسالی کشاورزی در تمام سال‌ها وجود ندارد. برای سال 2006 علی‌رغم اینکه بارش بیشتر از سال‌های قبل و بعد و بیشتر از میانگین بارش استان بوده، اما براساس نتایج شاخص NDVI این سال همراه با خشکسالی کشاورزی (کاهش ارزش شاخص NDVI) بوده و برعکس در سال‌های 2002 و 2004 که بارش کمتر از سال 2006 رخ داده اما شرایط دیم و مرتع بهتر از سال 2006 بوده و همچنین در سال 2003 با اختلاف 2 میلیمتر بارش در سال 2002، مقدار شاخص NDVIکاهش زیادی یافته است. نتایج این تحقیق ضرورت تعریف نمایه‌ای که همه این موارد را بیان کند دوچندان می‌کند. The issue of drought is very important in water resources studies. Meteorological drought indices are calculated directly from meteorological data such as rainfall, and in the absence of such data, they will not be useful in monitoring drought. Therefore, remote sensing techniques can be considered as a useful tool in monitoring drought. In this research, using MODIS remote sensing satellite images, the trend of vegetation normalized index changes in Isfahan province for the years 2000-2008 was investigated. In addition to vegetation, NDVI index can be effective in addition to natural vegetation for drought monitoring, especially for drought monitoring of dry farming type.Considering this index, the vegetation cover was classified into 4 groups and the area of each of the classes was calculated. Finally, two SPI and NDVI indices were compared. The result of calculating the SPI index show that the occurrence of severe drought is in 2008 and moderate droughts are in 2000 and 2001 in Isfahan province respectively. The calculation of the NDVI index in these three years also indicated that the poor vegetation cover has been significantly increased. High level Pearson correlation (+0.704) was observed between SPI and NDVI in significant level of 0.01. However, the results of the effect of rainfall on the NDVI index showed that there is no coincidence of the occurrence of meteorological drought and agriculture droughts in all years. For the year 2006, despite the fact that precipitation was higher than the years before and the years after and more than the average rainfall of the province, but based on the results of the NDVI index, agricultural drought has occurred this year (Devaluation of the NDVI index). On the contrary, in 2002 and 2004 that precipitation was lower than 2006, but dry farming and pasture conditions were better than 2006. And also, in 2003 with a difference of 2 mm in precipitation compared to 2002, the NDVI index value dropped significantly. The results of this research double the necessity of defining a profile that expresses all of these issues. 1- جعفری، ر، بخشنده مهر، ل، (1393)، بررسی تغییرات مکانی شوری و قلیائیت آب‌های زیرزمینی استان اصفهان با استفاده از زمین آمار، مجله علوم و فنون کشاورزی و منابع طبیعی، علوم آب و خاک، سال 18 ، شماره 68،194-183. 2-دلاوری،ع، (1387)، «احتمالات و آمار کاربردی در روان شناسی و علوم تربیتی»، اﻧﺘﺸﺎرات رﺷﺪ، 536 ص. 3- رضیئی،ط، ثقفیان،ب ، شکوهی ،ع ر، (1382)، «پیش بینی شدت- تداوم-فراوانی خشکسالی با استفاده از روش‌های احتمالاتی و سری‌های زمانی (مطالعه موردی استان سیستان و بلوچستان )»، مجله بیابان، جلد 8 ، شماره 2،292-310. 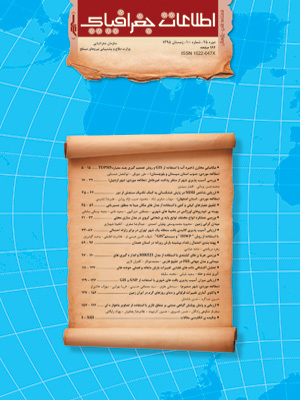 4- رضایی مقدم، م ح، ولی‌زاده، خ، رستم زاده، ه، رضایی، ع، (1391). «ارزیابی کارایی داده‌های سنجنده‌ی MODIS در برآورد خشکسالی (مطالعه‌ی موردی: حوضه ی آبریز دریاچه ارومیه)»، جغرافیا و پایداری محیط، شماره 5 ،52-37. 5- شریفان، ح، رحیمی، ل، (1392)، «پایش خشکسالی براساس نمایهSPI، دهک‌‌ها و نرمال»، اولین همایش ملی چالش‌های منابع آب و کشاورزی، انجمن آبیاری و زهکشی ایران، دانشگاه آزاد اسلامی واحد خوراسگان، اصفهان ،17 بهمن،1392. 6- لشنی زند، م، (1383)، بررسی اقلیمی خشکسالی‌های ایران و راهکارهای مقابله با آن، رساله دکتری. دانشگاه اصفهان، 86. 7-Bhuiyan, C, Kogan, FN, (2010), ‹‹Monsoon variation and vegetative drought patterns in the Luni Basin in the rain-shadow zone››. Internationa Journal of Remote Sens, 31(12):3223-3242 . 8- Cancelliere, A, Mauro, B andRossi, G,(2007),‹‹ Drought forecasting using the Standarized Precipition››, Journal of Water Resource Management . 21: 801-819pp. 9-Chaudhry, A, (2009). ‹‹Identification of drought vulnerable areas using NOAA AVHRR data››, International Journal of Remote Sensing, 30(10),2653-2668 pp. 10-Funk, C, Budd, M E ,(2009), ‹‹Phenologically- Tuned MODIS NDVI-based production nomaly estimates for Zimbabwe››, Remote Sensing of Environment,113(1), 115-125pp. 11- Giddings, L, Soto, M, Rutherford, B M and Maarouf, A,(2005), ‹‹Standardized precipitation index zones for Mexico›› Atmosfera,, (2) 26, 33-56PP. 12- Heim, R R, (2002),‹‹ A Review of Twentieth-century Drought Indices Used in United States››, Bulletin of the American Meteorological Society, 84, 1149-1165pp. 13- Hung, W U, Hayes, M J., Wilhite, D Aand Svoboda, M D,( 2005),‹‹ The effect of the length of record on the standardized precipitation index calculation››, International Journal of Climatol 25, 505-520,pp. 14- Ji,L and Peters, AJ, (2003), ‹‹Assessing vegetation response to drought in the northern Great Plains using vegetation and drought indices››, Remote Sensing of Environment, 87, 85-98pp. 15- Jian ,W and Shuo,L,(2005), ‹‹Effect of climatic change on snowmelt runoffs in mountainous regions of inland rivers in Northwestern China››, Earth Sciences, 49(8),881-888pp. 16- Lukas, A and Vasliliades, L, (2004). ‹‹Probilistic analysis of drought spatio-temporal characteristics in Thessaly region, Greece››, National Hazard and Earth System Sciences, 4, 719-731pp. 17-Manandhar, R, Odeh,I O A, Ancev,T, (2009). ‹‹Improving the Accuracy of Land Use and Land Cover Classification of Landsat Data Using Post-Classification Enhancement››. Remote Sensing, 1, 330-344pp. 15- Murthy, C S, Sai, M V R S, Chandrasekar, K, Roy, P S, (2009),‹‹ Spatial and temporal responses of different crop-growing environments to agricultural drought: a study in Haryana state, India using NOAA AVHRR data››, International Journal of Remote Sensing 2897-2914, (11) 30 , pp. 19- Safari Shad M, HabibnejadRoshan, M, Ildoromi, A,(2014).Integration of the MODIS Snow Cover Produced Into Snowmelt Runoff Modeling. Journal of Indian Sociocty of Remote Sensing , 42(1),107–117pp. 20- Rouse, JW, Haas, RH, Schell, JA, Deering, DW, (1973) »Monitoring vegetation systems in the Great Plains with ERTS«, Third ERTS Symposium, NASA, SP-351 I,309-317pp. 21- Wilhite, D A, (2000),‹‹ Drought as a natural hazard. In: Wilhite, D. A (Editor), Drought: A Global Assessment, Routledge, London. 1-18pp.